Lauren Leggatt is a blogger turned graphic designer and the brainchild behind the Etsy shop, Lauren by Design. With a love for photography and art, and a talent in graphic design, Lauren creates handcrafted and designed MacBook skins, each of which was created from her experiences or things she loves in life. Her marble inspired decals, along with all the other funky, cute and colourful designs are hot right now because they help personalize a MackBook and show off who you are as an individual. Lauren shared with Modern Mix Vancouver the story of how Lauren by Design came to life, as well as her hopes and aspirations for her Etsy business that she is so passionate about. Q: Can you tell us a bit about Lauren by Design and your vision is behind it? A: Sure! Like most things in life, one thing leads to another and being open to possibilities is a hugely important value in my life. Lauren by Design was initially a blog where I would share tidbits of my life, DIY projects, fashion and food. The Lauren by Design store is just in its early stages (I’m hoping to expand in the near future) but at the moment it’s a place for people to find totally rad mac book decals to give their laptop that extra bit of flare. If I’m being totally honestly it’s hard to pinpoint exactly what or who Lauren by Design is as a company because it’s still evolving and I have so many aspirations and goals for it! Essentially my vision is to create things that I love and ultimately create products that will inspire other people and bring visually stunning pieces that represent them and their uniqueness into their lives. Q: How did you go from blogger to graphic designer? When was the turning point? A: I started blogging when I was in my teens after I watched the movie Julie and Julia (which I highly recommend). I knew right away that I wanted to turn blogging into a business so I was constantly improving and making my blog better, both in content and design. The turning point was about two years into blogging I started getting a lot of emails asking me about where/who/how I designed my blog. I loved the design aspect and helping people create a design they loved so everything just went from there. Q: When did you know you wanted to create handcrafted and designed MacBook decals? 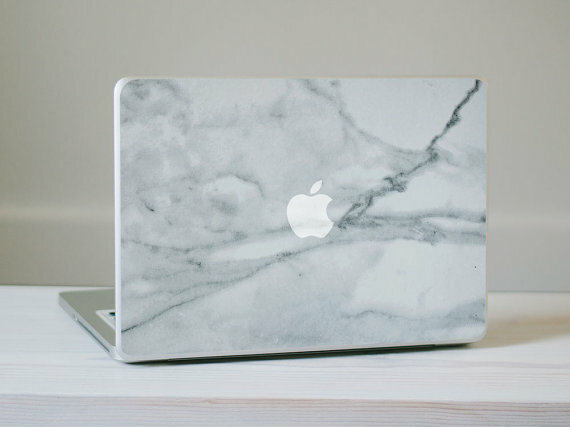 A: I think I was watching TV and scrolling through Instagram – hello multitasking – when I saw a photo of a really gorgeous marble mac book cover. I thought it was such a beautiful and minimalist form of self-expression that I instantly thought about designing my own. Luckily my family also owns a small print company (www.mybigpics.ca) on the island so it was the perfect equation and was really just a matter of time before I started creating my own decals. Q: From your descriptions, it sounds like a lot of your decal designs are inspired by experiences and the things you love in life. Will that continue to be the foundation of your decals? A: Yes! I think as a designer or even a creative person in general most of your work comes from a deeply passionate place when you surround yourself with what you love in life. Q: Who are some designers that have inspired you? A: Anna Bond of Rifle Paper Co and Bri Emery of Design Love Fest. Also Jen Gotch of Ban.Do, her Instagram also always has me giggling. Other than being some incredibly talented creative ladies they’re also out there doing what they love – and ultimately that’s all I want from life. Q: You mention custom blog design on your Etsy shop. Is this a service you’re offering as well? A: It is! I’ve been doing more website design work lately though (www.laurenleggattdesign.com) but blog design totally fits into that category. Q: Besides phone cases, are you thinking of any other items for your decals? Ie, iPads, other types of laptops, etc. A: YES, and I’m so excited about whats to come! I’m currently looking at various other products to create designs for, there are so many possibilities which is awesome and also overwhelming at the same time. There definitely will be phone cases and hopefully iPad covers (but those will be a while from now). Q: What are your future plans for Lauren by Design? Where do you want to be in five years? A: Gosh, what a tough question! All I can really say I’ll keep expanding, creating new things and see where this all leads. But I mean, ultimately I’d love to turn Lauren by Design into something that has grown A LOT in five years. Something like a large studio with white brick walls, huge windows, fresh flowers everywhere, good music playing, fresh coffee brewing and shipping out decals and other products to people around the world with a great team by my side. A: If you haven’t already heard of Sophia Amoruso, I’d highly recommend reading her book “#GIRLBOSS”. I regularly find quotes that inspire me and this one really stuck out when I read her book.